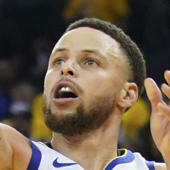 The Golden State Warriors have seemed pre-ordained to repeat as NBA champions since the moment the season began, with their dominant victory over the New Orleans Pelicans all the way back on opening night. On Monday night, their long journey to the NBA title could come to an end as they look to close out the Cleveland Cavaliers in Game 5 of the NBA Finals. Outside of an injury to Stephen Curry that caused the Warriors to lose a total of two games in the first two rounds, and an impressive, admirable effort from the Oklahoma City Thunder in the Western Conference finals, the Warriors have cruised this season. The Cavaliers thought they might have found something after a dominant Game 3 victory, but their success was fleeting. The Warriors corrected their issues, played with more intensity, got their 3-point shot to fall, and took a dominant 3-1 series lead. The numbers are not good for the Cavs' chances of a comeback, as you'll see below, and the usual "but they have LeBron" response doesn't resonate because the Warriors have essentially neutralized James despite his quality per-game numbers (more on that below as well). The Warriors look to clinch their first-ever back-to-back NBA championships Monday night in Oracle, 9 p.m. ET on ABC. Here's where the series stands after Game 4. Before Game 4, I warned that it was very much possible that instead of finding adjustments and a solution for the Warriors, that Golden State just had a bad game. If so, there was every reason to think they would play better and win Game 4, effectively ending the series. That's what happened. Though they started off rocky, and the Cavaliers lead by eight points at one moment, it wasn't enough, and the Warriors eventually splashed their way to a win. No team has ever lost after going up 3-1 in the Finals (32-0). Surprisingly, teams are just 13-10 in Game 5's at home after going up 3-1, so there's at least a little hope that Cleveland can push the series back to Cleveland to give themselves a chance at the biggest comeback in NBA Finals history, but in reality, this is done. The Warriors have led for the majority of the series, dominate in nearly every statistical category, have won all the matchups, neutralized LeBron James, stymied Kyrie Irving, negated J.R. Smith, and likely have already gotten Kevin Love traded. All that's left is to figure out how many games it takes, where the Warriors stand as an all-time team, and where the Cavaliers go from here. Oh, and what happens with Draymond Green out. The Warriors can still win. Green has been terrific, with the Warriors outscoring the Cavs by 13.6 points per 100 possessions with him on the court. He's defended LeBron James, knocked down 3-pointers, made key passes, and helped get into James' head while protecting the rim. Yet Golden State is at home, and if Green is out, the emotion of playing without him might be enough to carry the day. With Green out, expect the Warriors to move Iguodala into the starting lineup, with a modified smallball unit featuring Andrew Bogut at center. Their smallball advantage is less with Bogut on the floor, but their versatility at 1-4 still gives them an advantage, especially since the Cavaliers will still be starting Tristan Thompson. Mo Speights likely gets more time, and that helps the Cavs, but if the Warriors simply shoot the lights out as they are prone to at any time and especially at home, Golden State can still secure the title. Green will not be allowed into the building until after the game was over, so any championship celebration will likely have to wait until he was through security and into the building. Well ... I've got very little for you. Benching Kevin Love helped for a while. He was better vs. the non-starter lineups in the first half, but finished with a minus-4, primarily when the Warriors started targeting him again. Richard Jefferson, his replacement, was a minus-1, even in the first half. There aren't really any answers for the Cavaliers. They have to shoot the lights out and hope the Warriors don't play well. That's really it. If the Warriors play well, they simply can't beat them. That much is apparent at this point. The Math Problem: The Cavaliers actually dominated the paint in Game 4, winning 48-20. (They outscored the Warriors by 28 points in the paint and lost by nine!) They won on the offensive glass, with 25 second-chance points to 19 by the Warriors. But the Warriors hit 11 more 3-pointers. That's your ballgame. That's your series. That's your season. The Warriors had 11 more attempts from deep than the Cavs, and that's a number that gets lost. You have to be able to prevent the Warriors from getting those shots up, which is the hardest part of defending them. The Cavaliers set the record for most 3-pointers earlier in the playoffs vs. Atlanta with 25 made 3-pointers. The Cavs had 25 attempts from deep in Game 4. Being able to make 3ss often isn't as important as being able to generate 3-point looks in volume, and, even more importantly, being able to restrain the number of those attempts. The Cavs have to shut down the Warriors' perimeter attack at any cost. Surrender layups. Abandon the mid-range. But they have to stay locked down on shooters, particularly after offensive rebounds. Iguodala bodies him on the catch in the post, challenges his dribble on the drive. The Warriors also bring swiping help and contest at the rim, the perimeter defense stays home on shooters, and they prevent the offensive rebound. James is frustrated; that was evident in Game 4. There are no adjustments he can make because he can't magically get his jumper to a place it was two years ago. It's going to take a full year of work to get it back to where it needs to be, with adjustments to his legs and form. There is no easy remedy. The best all-around player in the league (even if Curry is "the best player in the league") has been rendered impotent (without force or effectiveness) and it is a credit to the Warriors' defense that he can't save them. The 1-2 pick and roll: The Warriors made a few tweaks in their pick-and-roll game to free up the Splash Brothers in Game 4, and they worked. Zach Harper broke down the ways that Curry and Thompson freed themselves in Game 4 with help from the Cavaliers' poor defensive attention. The Warriors used Thompson as the screener, forcing the Cavaliers into an impossible decision between not trapping Curry and leaving him in space and leaving Thompson wide open. No good options. More of that in Game 4 will secure the repeat. No letdowns: The Warriors didn't bring their best selves in Game 3, and it cost them. They were complacent, and while everyone got excited about what the Cavs were doing, in the end, it was just about the Warriors not bringing the energy they needed. Green's suspension looms large here. He's the emotional engine of the team, Steve Kerr always says the Warriors "need his fire." With him out, someone will have to be that emotional spark plug. Maybe it's Curry, maybe it's the typically reserved Thompson, maybe it's Andrew Bogut, consummate veteran. Whoever it is, they need that to keep their energy level high. Feed off the crowd, play your game, and secure a second successive title, cementing a dynasty in the Bay. Teams have never lost a 3-1 lead in the Finals (32-0). Teams are 13-10 at home in Game 5 of the Finals after going up 3-1. Teams are only 5-7 after losing Game 3 and winning Game 4 to go up 3-1 per WhoWins.com. The Warriors have 29 more assists on only six more made field goals in this series. That is incredibly telling. Golden State has outscored Cleveland by 60 points from the arc in this series. The Cavs have more rebounds, more points in the paint, more second-chance points, and more fast-break points in this series. Per ESPN, the Cavs are plus-31 with LeBron James on the floor and Andre Iguodala off the court in 44 minutes in this series. They are a minus-48 with James and Iguodala both on the floor, a stunning testament to Iguodala's repeat-Finals-MVP candidacy.